There’s no better way to enjoy Northern Michigan’s natural beauty than from the comfort of a patio. 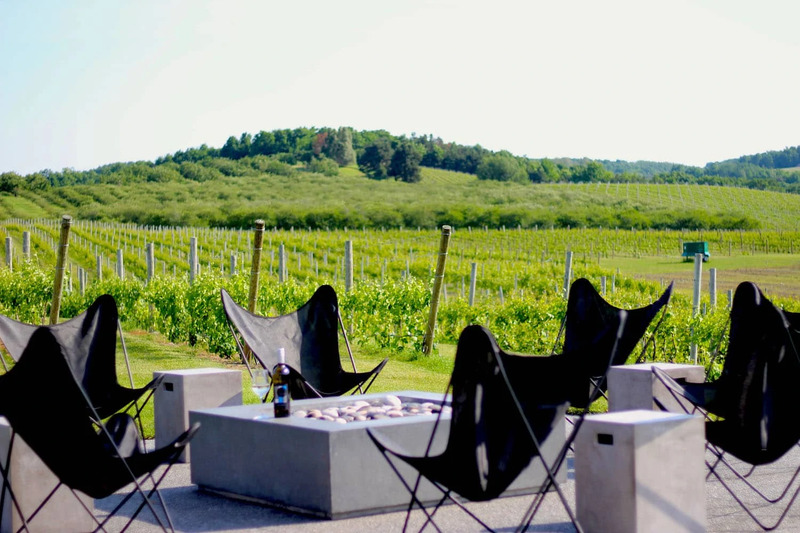 Taking it in with a glass of wine in-hand is even better, so we asked our readers what local wineries have the best patios. Here are their top picks. This castle-like winery lies at the summit of a long, winding drive. Perched high atop the spine of Old Mission Peninsula, with a patio to the east and a terrace to the west, Chateau Chantal offers an impeccable vantage point from every direction. Discover a breathtaking view of Power Island and the pristine East and West Bays while sipping a glass of their bright Pinot Blanc. It’s certainly No. 1 for a reason! Overlook rolling vineyards from atop the outdoor patio at Brys Estate. We recommend ordering a frosé (frozen rosé) while you enjoy one of the best views Old Mission Peninsula has to offer. While you’re there, make sure to try out Brys Estate’s new Wine Wagon. You’ll learn about the magic and history of Brys with a stop at the Secret Garden. No matter your party size, Bonobo has the perfect space for you. Claim a picnic table on the expansive patio for a dynamic group conversation with a captivating backdrop. Opt for a cozy corner inside for a secluded one-on-one moment. With popular events all throughout summer—particularly their live music every Friday from 6–8 p.m.—Bonobo’s energy builds from more than just its remarkable view. 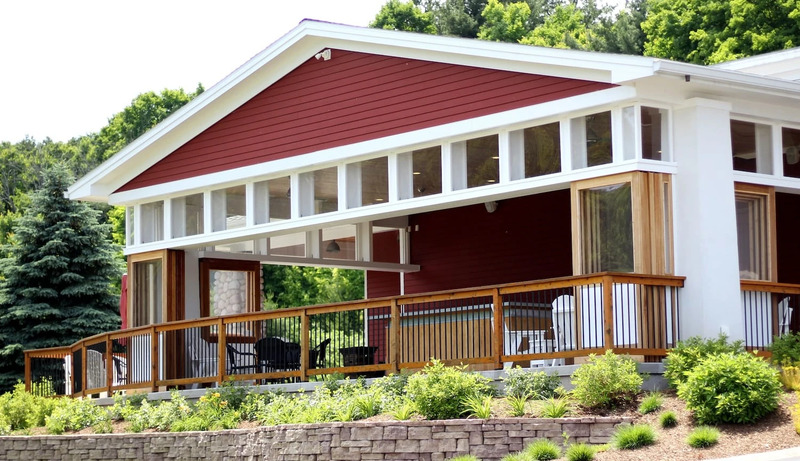 Tucked into the rolling hills of Leelanau County, Black Star Farms has a lot to offer. With horse-speckled pastures, a stately inn and a farm-to-table cafe, the bar-adorned patio is only one of many treasures to discover here. Take it all in from a fireside lounge chair on the shaded patio deck. Best of all, there’s no need to fret when the leaves begin to fall; panel doors extend from the wooden beams to enclose the patio, ensuring a cozy experience all year long. The view stands as one of the most tranquil in Northern Michigan. This is that postcard-sunset spot, the one where the dust and fireflies bounce off rays from the setting sun. When you sit down in the golden-hour, you’ll probably ask yourself if you’re living a fairytale. Let that sun kiss your cheeks and the wine enchant your taste buds; this is a moment and a view worth enjoying. 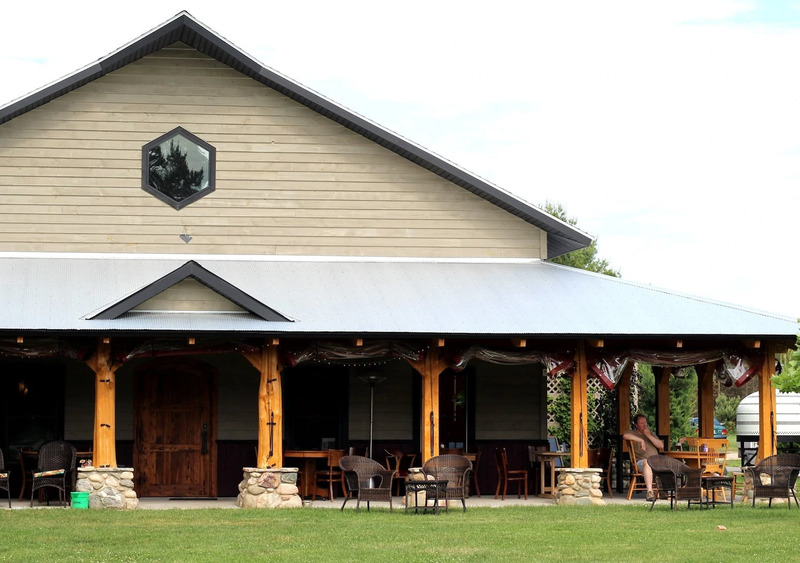 Tucked into beautiful Benzie County, St. Ambrose Cellars is the perfect spot to enjoy a warm summer day out in the country. A sprawling lawn peppered with yard games, bocce ball and a disc golf course makes it fun for the whole family. Be careful not to get stung by bumblebees while meandering about the quaint garden; not only do they offer wine and beer, but this tasting room also houses a meadery! In search of effervescence this summer? 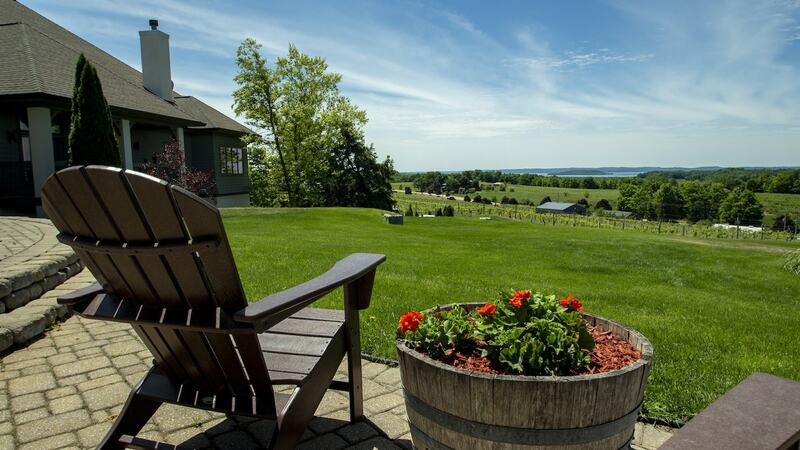 Head out to Suttons Bay where you’ll find L. Mawby Winery. The bubbles-only establishment will leave you feeling refreshed and lighter on your feet. 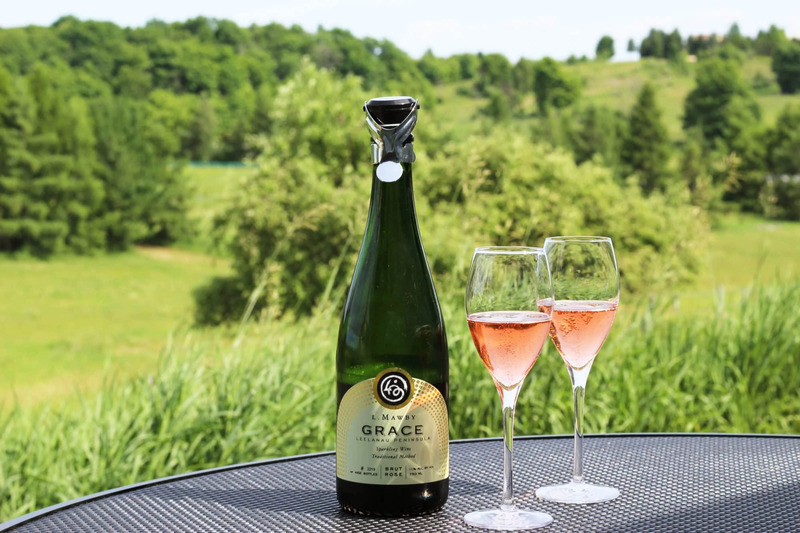 Step outside and enjoy your sparkling wine on the patio, and take in the green of the lush hillside and the sweet scent wafting from the nearby cherry orchards. 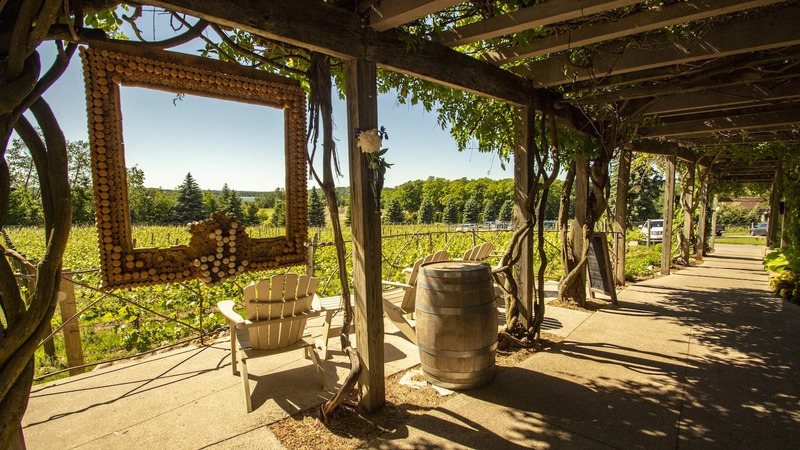 This patio transports you across cultures and time for a wine tasting experience that is unlike anything else in Northern Michigan. Between the stone arches and underground caverns reminiscent of ancient castles, you’ll feel like royalty as you sample a glass of Mari’s famous red, Bel Tramonto. 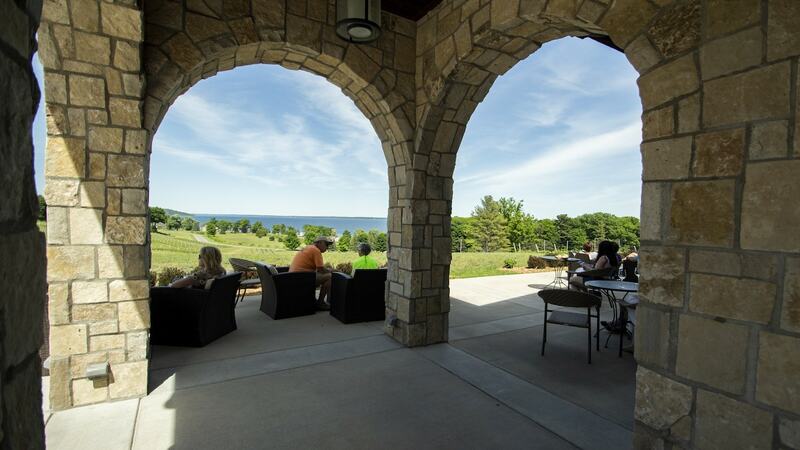 On select evenings, overlook the hillside and Grand Traverse Bay while you’re serenaded by live music. Named for the unique stones found on Lake Michigan’s shores in Leland, Blustone offers views that are uncomplicated and extraordinary. 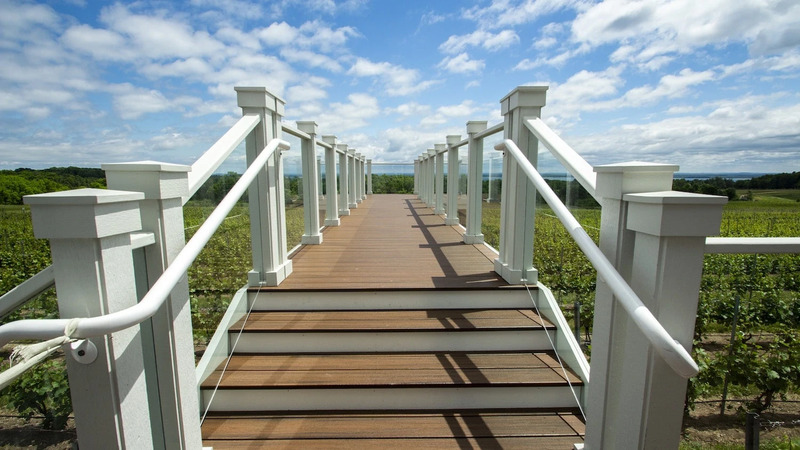 Relax on the open-air patio, looking out onto 40 acres of award-winning vines. Soak in the sun or cozy up to one of Blustone’s contemporary fire pits. June through August, enjoy Foodie Fridays where food is served from local vendors from 4–8 p.m. 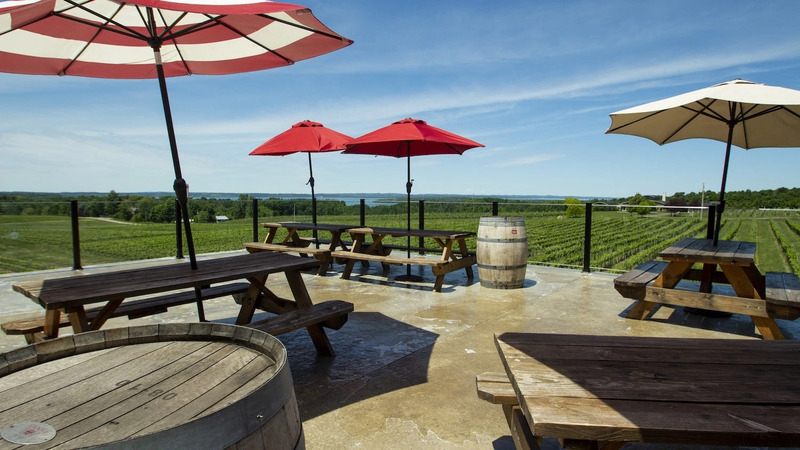 Though 2Lads Winery doesn’t technically have a patio, voters deemed their panoramic views worthy of note. The modern and industrial-style tasting room gives you a bird’s eye view of rolling hills and sapphire Lake Michigan waters. So come, sip your vino of choice and enjoy the sparkling bay from inside their chic space, complete with the luxury of air-conditioning.